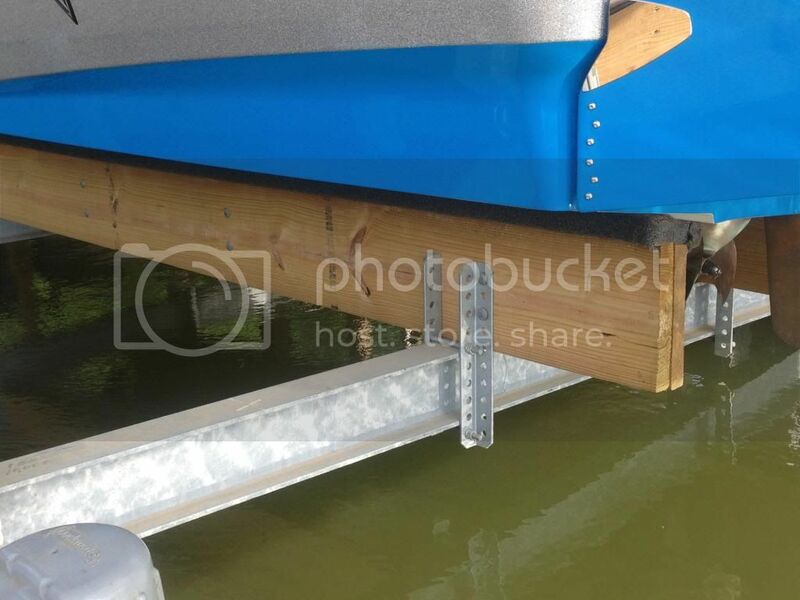 How does your boat sit on the lift? 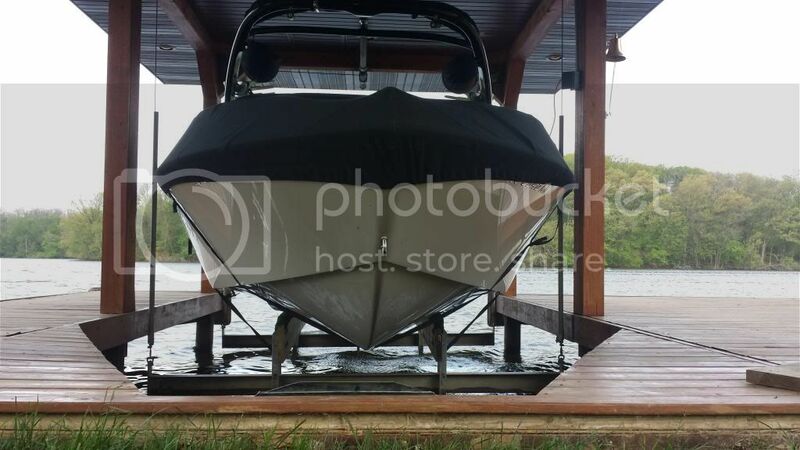 Below are some pictures of our boat on the lift. We used to have the boards set at more of an angle but this year we positioned them straight up and down. The boards are set closer together at the bow probaly 3-4" closer than the back. 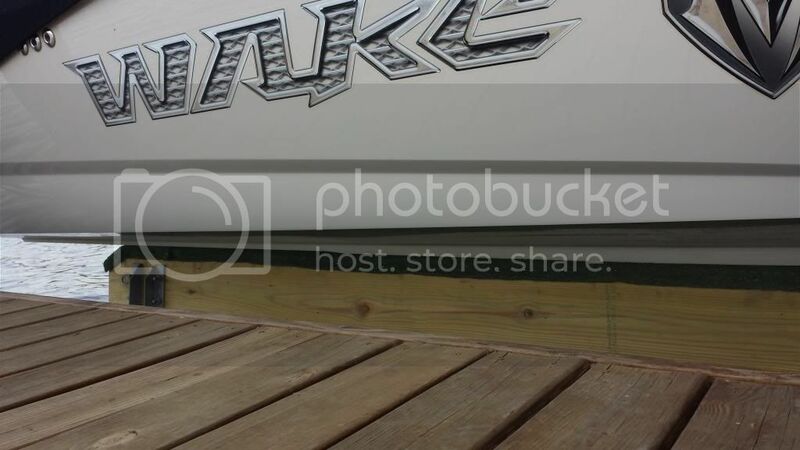 As you can see in the pictures the edge design on the bottom of the hull rests on the board. Should I position the boards so that they are on the inside or outside of this edge? I am sure its not good to have this edge sitting on the boards. 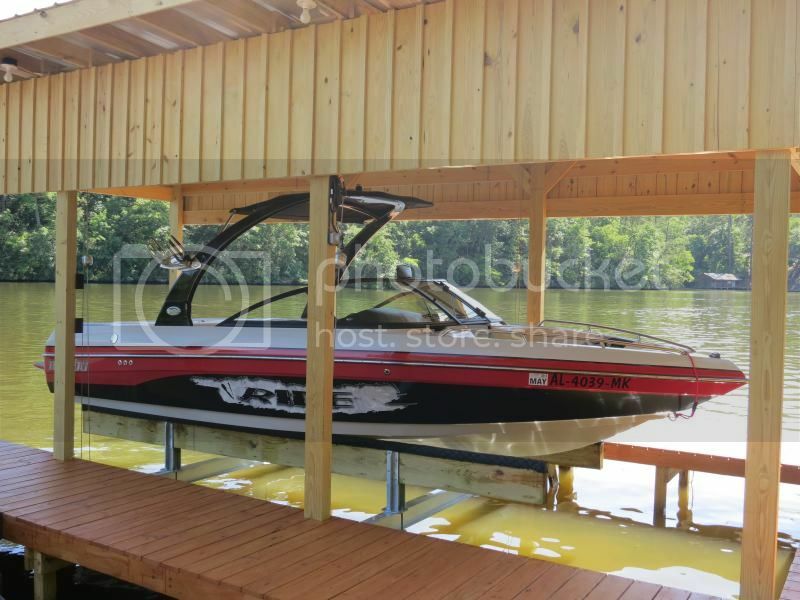 Please share how your boat sits on the lift. looks like if you move them closer together slightly you will be fine. I think that's how mine are set up but from those angles its hard to tell. Doesn't your trailer have 4 bunks on it? Seems like that would be a good way to setup the lift too. Also seems like it would be good to not position the bunks so they rest right on the chines. 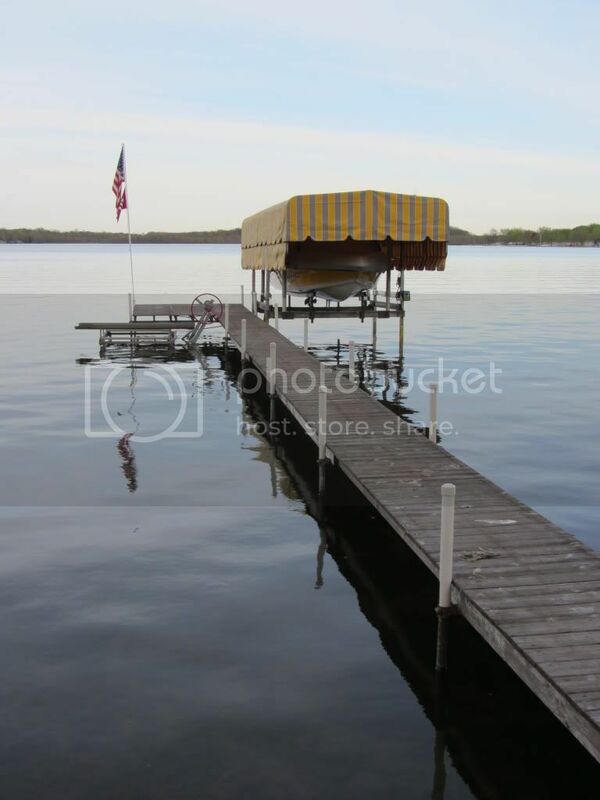 Just wondering, if you move the boards together would the boat be more likely to tip over in a strong strom/cross wind? Maybe add two more boards. I would have trouble sleeping if the boat wasn't resting comfortably, but that may just be my ignorance. Our bunks started here and we ended up moving them out. While it wouldn't hurt, I think 4 bunks is overkill. 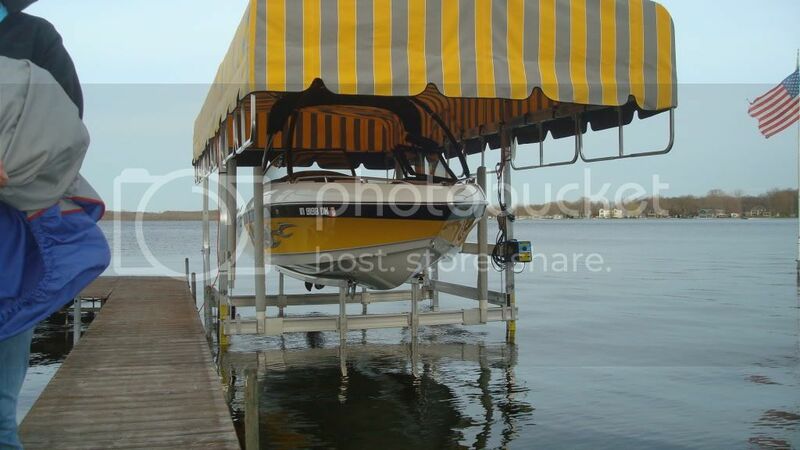 Lots of boats on our lake for a long time with a 2 bunk lift. 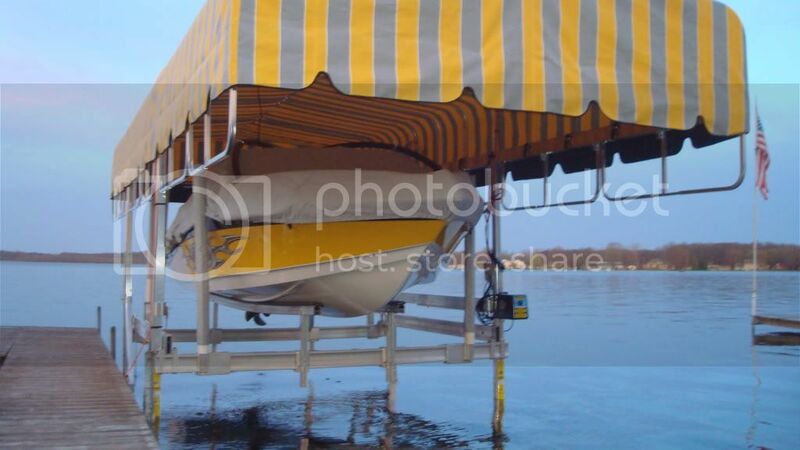 Remember the forces between the boat/bunks is nearly static on the lift. 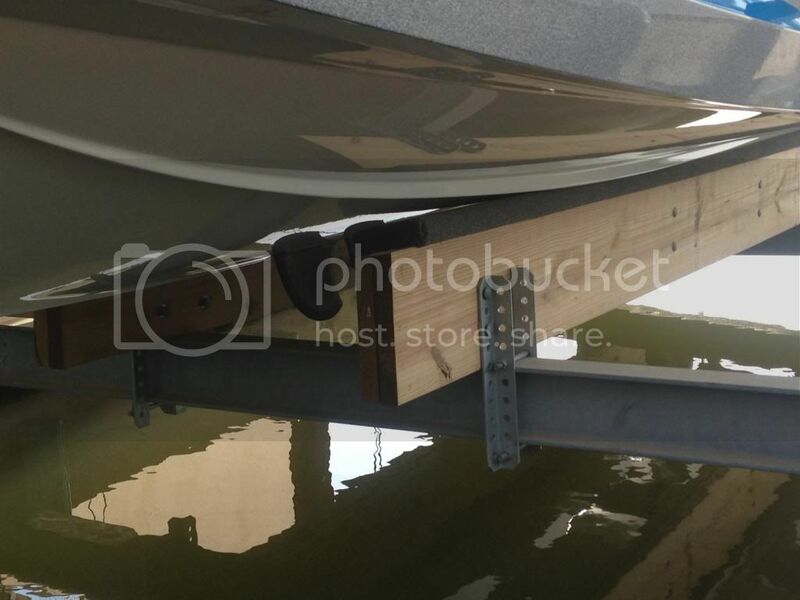 The forces on the boat when trailering are many times greater. You are right about the chines... This is two points of contact. 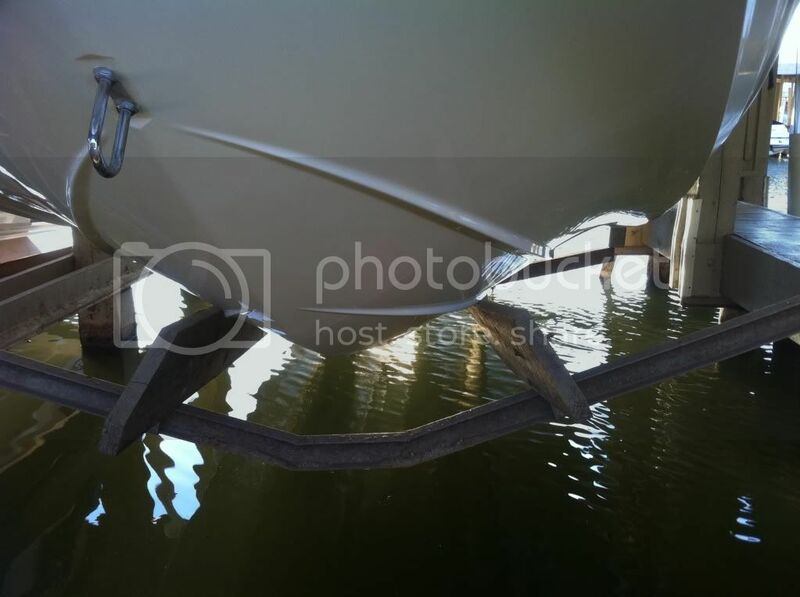 It is going to wear out the bunk pre-maturely, may chip the gel as the bunk wears, and is likely stressing the hull. I'm surprised it uses the narrow edge of the boards for the bunks. Me too, it does not look right at all. And the bunks are held to the brackets by bolts that are probably not designed with "shear weight" in mind. Mine are 2x6 laying flat side up, on a bracket that swivels back and forth so that it contours the hull. But yeah, to answer the question, I'd move them away from that chine. Most bunks are roughly 36" apart. The bunks on my new lift are 41" apart, but I'd prefer if they were about 39" to get them a little further from the chines. It is better to be a little inside the outer chines. So are mine too wide? 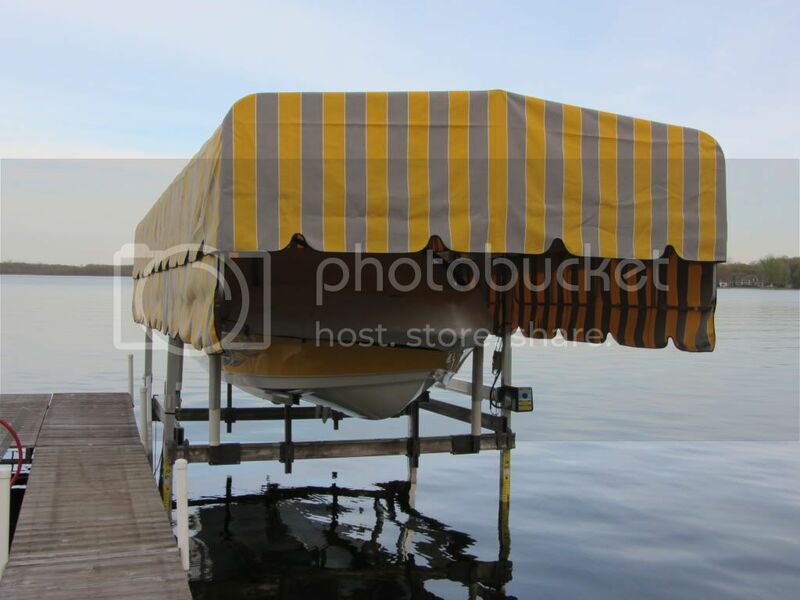 Anecdotally, I see bunks in this orientation all the time on my lake. Doesn't seem to cause problems. I actually prefer the other orientation on pivots... seems like it would distribute force better. I run mine wide, too. Going outside the chines let's the boat settle in. Also, it keeps you far away from paddle wheels, intakes, etc. Where are your stringers relative to your bunks? I think just outside of the chines would be fine also, but I wouldn't want them straddling over any chine. Actually rotating the board does less to distribute the force and the board is so weak in this direction, it bends to the boats form as noted above. What this means is the boat is actually spanning to the points where the boards are connecting to the cradle and putting a high load in that one area. I am working on designing a custom cradle lift for our new LSV as we have a shallow area and a typical cradle lift is too thick. I am having to use steel runners to be only 2" thick (tall). A 2x is only 1-1/2" tall(width does not really matter in this calculation) and wood is much weaker, therefore a 2x8 on its side would not distribute the load very well. 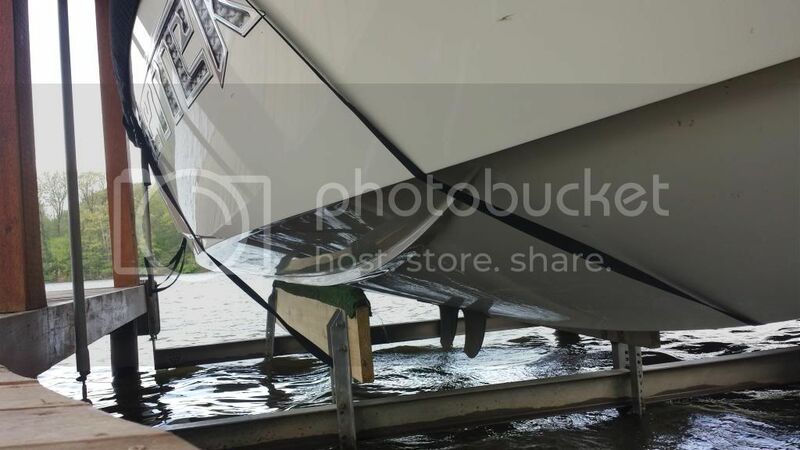 I think you want the bunks to flex and mold to the hull. I believe this provides a better load distribution. 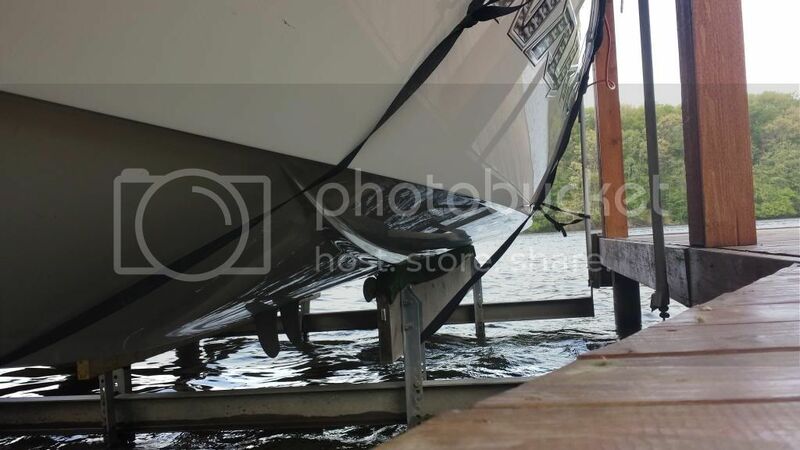 Hulls are curved, not flat. I also prefer wood bunk over metal bunks in case you end up crocked in the slip. My prop has a better chance winning in an encounter with wood over metal. Just use your trailer bunks as a template for you lift... easy. Can you imagine if those bolts did shear? The supports would be like spears going through the hull. No likey that design at all. All, i just installed a new lift this year and have some input. I used a pair of 2x12's per side, cut them at a 10 degree angle, bolted together then added a 2x6 on top of the 2x12's wrapped in marine grade carpet. It's solid and will last a long time. 2x12 boards Boards are 30" apart. All, i just installed a new lift this year and have some input. I used a pair of 2x12's per side, cut them at a 10 degree angle, bolted together then added a 2x6 on top of the 2x12's wrapped in marine grade carpet. It's solid and will last a long time. 2x12 boards Boards are 30"
Really like your design joe and we are going to do the same for our lift. Do you have both the front and rear spaced 30" apart? I've tried angling mine in, using single board, elevating the boards, having them wider/narrower - and we settled on this and it has worked very well. I have/do run single 2x12's that are completely vertical. Have done so for several years with no issues. Just move yours in a few inches. With them sitting on the chines or that close your going to battle every time you lift it trying to get it to sit level. Battled with this my first year until I moved them in. Now I have no problems. daylorb, where do I find those $150 brackets for the guide post?